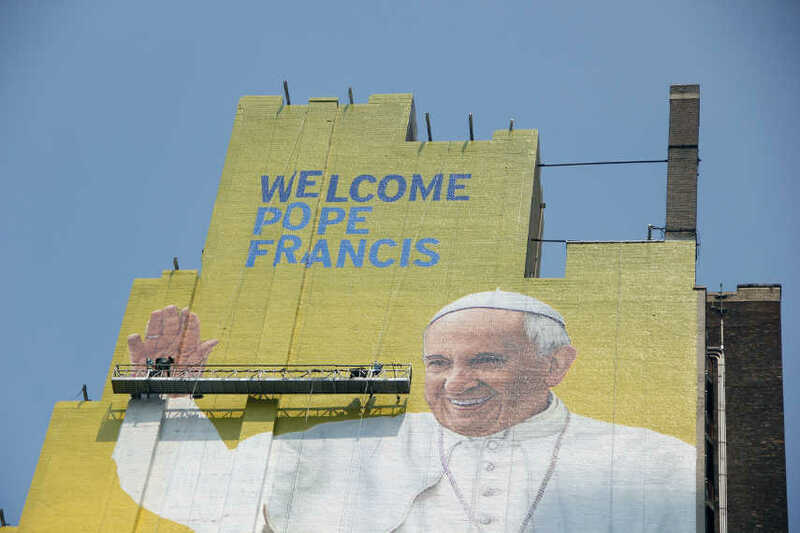 Giant Pope Francis Mural Pops up in New York to Welcome the Pontiff ! In September, Pope Francis will visit New York City. He will stay in the art capital of the world only for a day and a half, before he carries on to Philadelphia, but nevertheless, he will manage to do quite a few things while in New York. First, Pope Francis will address the United Nations General Assembly, then he’ll hold a multi-religious service at the 9/11 memorial site. Then, he will go to Central Park to meet some regular New Yorkers, he’ll pay a visit to Our Lady Queen of Angels School in East Harlem, later he’ll celebrate Mass at the Madison Square Garden, and then he’ll pray the Evening Prayer at a Vespers service that will be held in the renown St. Patrick’s Cathedral. Quite a busy day, huh? But, during this busy day, Pope Francis will not be the only Pope Francis in New York City. 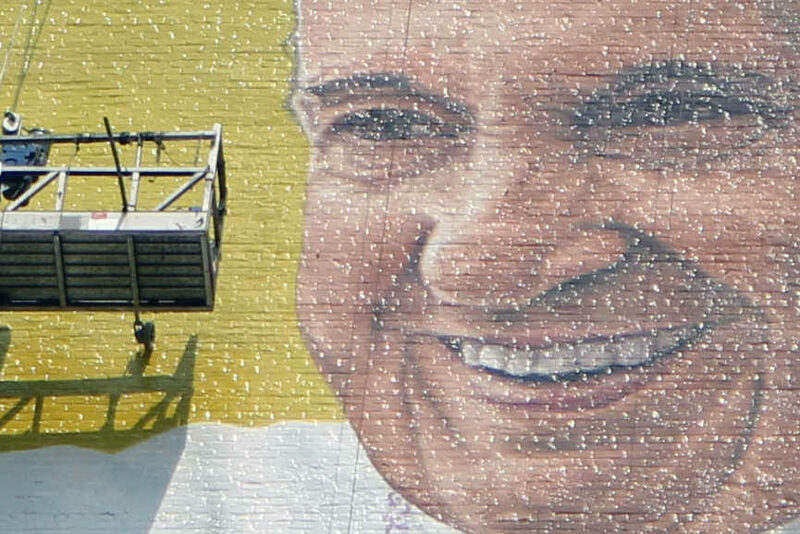 The other one will be a much, much bigger version of the Pope, standing more than 180 feet and smiling all the time. 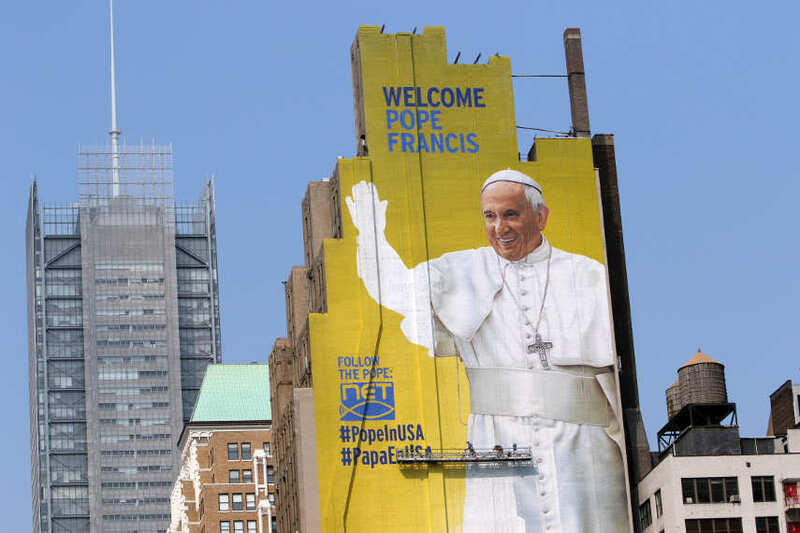 Yes, the giant Pope mural was created just a few days ago on one of the buildings in New York – actually, we’re able to give you an address – 494 Eighth Avenue, but you’ll probably be unable to see the artwork from there, as it is enormous: you should try from 34th Street and Penn Plaza. 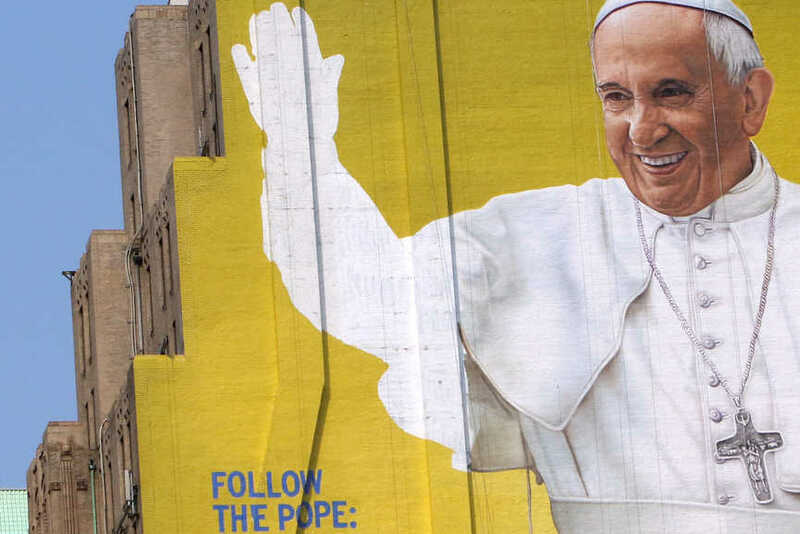 This New York’s huge mural of the Pope was created by artist and Catholic convert Van Hecht-Nielsen (also known as Van Rainy Hecht-Nielsen). This 41 year-old artist was given a commission by the Diocese of Brooklyn, and he did a splendid job, capturing the essence of the Pope Francis – smiling and full of joy. As opposed to his predecessor, Pope Benedict XVI, who wasn’t even close of having reigning Pope’s public image, Pope Francis (born as Jorge Mario Bergoglio) is being known as a humble, informal, simple and tolerant, and he is being respected not only by the Catholics, but by the non-Catholics and the non-Christians, as well. So, we must congratulate Van Hecht-Nielsen for catching a perfect image of Pope Francis. 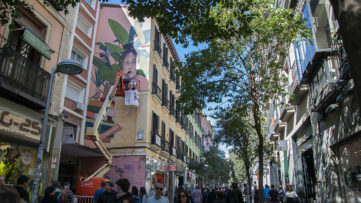 Van Hecht-Nielsen said that it wasn’t easy working on a mural in the middle of the August. But, that was “a great blessing”, he said to the New York Daily News. Actually, this artist had been painting the same wall on the 494 Eighth Avenue for the past eight years, with the advertising for Cadillac being the most recent painting. 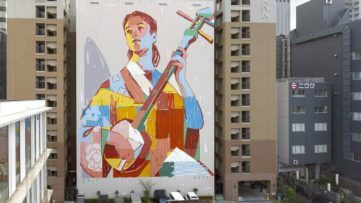 But, this was, by far, his biggest assignment, both because of the size, and because of the person on the mural. Pope Francis, who will be visiting the States from September 22nd to September 27th, and who will travel to three cities – Washington D.C., New York City and Philadelphia – is only a fourth reigning Pope that will visit the United States. Before him, Pope Paul VI was in the U.S. in 1965, Pope John Paul II visited the States seven times, and Pope Benedict XVI was there in April 2008. Also, Pope Francis is the first Pope ever to come from Latin America (actually, make that first Pope from the whole Southern hemisphere), the first Jesuit to lead the Catholic Church, and the first non-European Pope since the Syrian Gregory III in 741. So, with all those “first ever” that characterize Pope Francis, no doubt that his visit to the U.S. will be somewhat historic, as well. And for those who won’t be able to see Pope Francis live, they will be able to see Van Hecht-Nielsen’s mural of the Pope, that will be on view through October 5th. 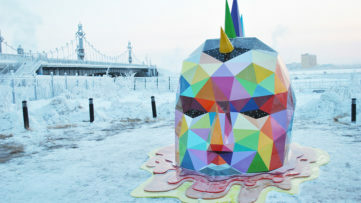 It is estimated that 700,000 people will see this artwork every week.